On a scorching August morning nearly a decade ago, Louisiana-native Princeton Carter ’20 first discovered he had a target on his back. It was the start of ‘Peewee’ football season, a near-religious event for youngsters raised south of the Mason-Dixon line, and Princeton was keen to lock up the local club team’s starting quarterback position for the second consecutive year. While his parents waited in line and signed the required paperwork, Princeton was approached by another boy who, without preamble, calmly told the incumbent QB that he intended to take that starting job by the season’s end. Mr. Carter was no stranger to hard work and perseverance himself. A former cornerback at LSU, he watched his son’s considerable prowess on the football field with a mixture of pride and apprehension. Already several of his old teammates were showing symptoms of CTE (Chronic Traumatic Encephalopathy), and Mr. Carter feared that his son’s fierce competitive nature would drive him to risk his body unduly in an already violent sport. With these anxieties in mind, the Carters resolved to find a sport that would keep their son’s competitiveness in check, while simultaneously teaching him resilience, humility and mental toughness. They settled on tennis. By the time Princeton began his freshman year at Isidore Newman School, a private institution in Uptown New Orleans, he was ranked among the nation’s top 100 junior players. Tennis was now his sole athletic focus, but Louisiana’s marked indifference towards the sport compelled Princeton’s family to travel as far as Atlanta and Tennessee in order for Princeton to play competitive tournaments. In addition to the grueling travel schedule, he was forced to contend with frequent displays of racism from opponents, parents, and tournament personnel, all of whom seemed to view a Black boy excelling at a white man’s game as cause for outrage. Often the racist remarks were directed at Princeton’s extended family. He specifically recalls an instance where an opponent’s father gave his mother the finger in plain view of the official, who promptly turned the other way and said nothing. The blatant racism that Princeton encountered on the tennis court mirrored the discrimination he faced in his high school classes. In perhaps the greatest injustice of all, the Isidore Newman faculty prohibited Princeton from having his ‘signing day’ (a term referring to high school athletes publicly committing to their university of choice in a ceremonial setting) on school premises, despite the fact that he had represented Isidore Newman at the LHSAA (Louisiana High School Athletic Association) Tennis State Tournament and won the state title three consecutive times. “Looking back, I think a lot of these experiences ended up helping a little bit because they gave me a thick skin,” Carter concluded. 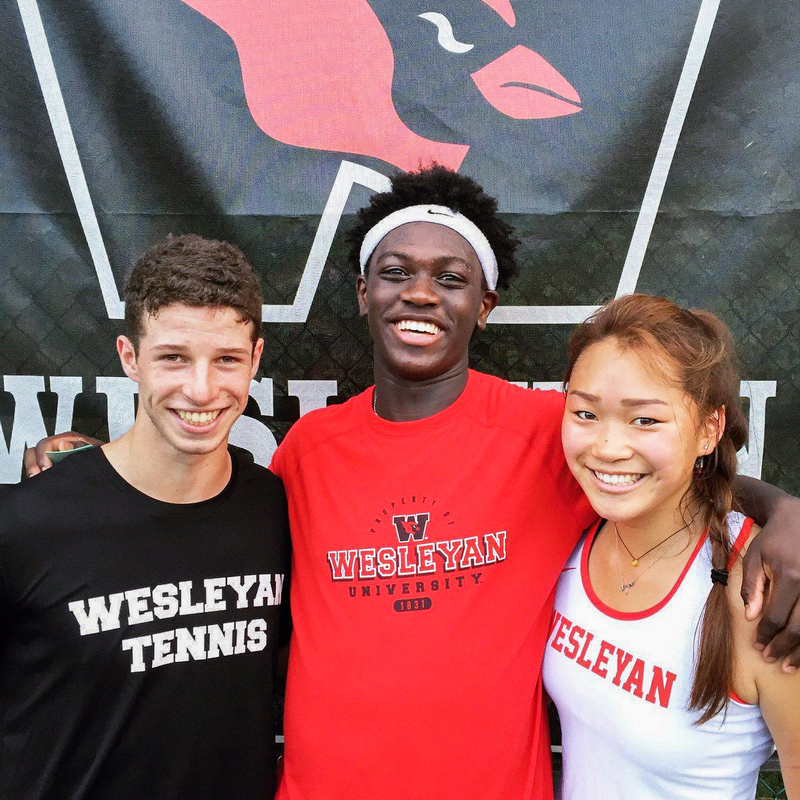 Princeton was drawn to Wesleyan for many of the same reasons as other talented scholar-athletes from around the county: its history of academic excellence, coupled with its blossoming athletic program. For Princeton, a Wesleyan education meant more than just a fancy degree and a shot at an NCAA title, however. After nearly two decades in Louisiana, Carter would be spending the next four years in a region of the country that was totally foreign to him. Upon arriving in Middletown, Princeton recalls being most impressed by the manner in which difference is acknowledged and celebrated on Wesleyan’s campus. Still, Princeton acknowledges that he remains an anomaly whenever he steps onto a tennis court, regardless of where he plays. 46 years after Arthur Ashe became the first African-American man to win Wimbledon, tennis continues to be a sport largely devoid of Black and Brown faces. Rather than discouraging him, Carter maintains that the notable absence of players of color merely strengthens his resolve to leave his mark on the sport and pave the way for younger generations of Black athletes to follow his example. Where once a single remark from a hostile party reduced him to tears, Princeton used tennis (a historically white and racist sport) to develop the resilience and grit required to confront a world that condemned him based on his appearance. As the men’s tennis team begins its spring season, he will strive continue to inspire a generation of Black and Brown athletes who aim to alter tennis’ whitewashed landscape. This was an enjoyable read but why do you capitalize “Black” and “Brown” and not “white”? I think it’s a stylistic decision designed to emphasize the marginalized communities. It is inconsistent, but I see what they’re doing. Stylistic or not, it’s yet another small but not insignificant wedge meant to divide the races. A poor choice indeed. There may be some challenges, stumbles or wedges along the way. It is important that those generally committed to moving beyond racism stay focused. It is important that we seek solutions, dialogue and understanding. It’s a community wide issue that we need to collectively work on together. This is a very frank article. None of this should be surprising. Tennis is an overwhelmingly white middle-class sport, both in those who play and those who watch. Kudos to the author and the player for the courage it took to share your story. It is no longer good enough for reporters, commentators and the community to turn a blind eye to racism. Now more than ever we need to come together to ensure that everyone is valued and respected on and off the tennis court. Princeton: I hope you have a winning tennis season.